Eight years after the Clone Wars ravaged the galaxy, the Republic is no more and the Empire is ascendant. The man who rules as Emperor is secretly a Sith Lord, and with his power apprentice, Darth Vader, and all the resources of his vast Imperial war machine, he has placed the galaxy solidly under his heel. Dissent has been crushed, and freedom is a memory, all in the name of peace and order. But here and there pockets of resistance are beginning to kindle and bunr, none hotter than the Free Ryloth movement led by Cham Syndulla. I've been a huge Star Wars fan since I was a kid (I can remember going to see the very first Star Wars film in the theater), but I have never read one of the novels before. By the time that I realized there were SW novels out there, there were already so many published that I didn't know where to start to get caught up on them, so I just let them slide, and continued on enjoying the movies. 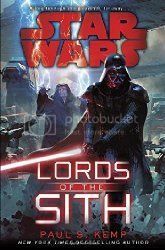 With the establishment of the new Lucasfilm official canon, I decided to try giving some of the new books a try, as it seemed much more manageable this way, and Lords of the Sith had recently been released, so it seemed as good a place to start as any. The planet of Ryloth is integral to the Empire as both a source of slave labor and the substance known as "spice" (this does bug me a little bit - come up with something that a little more original that doesn't sound like you lifted it directly from Dune), but the inhabitants of Ryloth want to be free. The "Free Ryloth" movement is created for that purpose; led by Cham and Isval, the movement has simply been trying to be a thorn in the Empire's side, but when they learn that both the Emperor and Darth Vader are personally coming to the planet, they see an opportunity to assassinate them both and watch the Empire dissolve as a result. Of course, without even reading the book, you know that the Emperor and Vader are going to survive this story since they appear in Episodes IV-VI, so it's no surprise that they do survive the attack. What makes this book interesting is seeing their relationship and how they deal with being thrust into a situation that neither were anticipating. It's also interesting seeing a book written more from the point of view of the villains that the heroes. Kemp does a great job in fleshing out all of the characters, tho; Cham, Isval, and the other freedom fighters are just as realized as the Emperor and Vader, even tho they are not the main focus of the story. However, it's the relationship between the Emperor and Vader that is the real highlight of the book; seeing their interactions throughout the book and how that relationship is tested, it the real essence of the story, and Kemp does a great job making that relationship feel real. The only true drawback that I would have to the book is actually getting to the main action of the book. We know that the Emperor and Vader are going to be trying to survive on Ryloth (this isn't spoilers, it's the whole point of the book), but actually getting them to the planet seems to take way too long. Practically half of the book is taken up with explaining aspects of the resistance unit, getting the Emperor and Vader to the planet, and finally the battle that forces them to crash land on the planet. I just kept wanting to jump ahead to when they finally arrive on the planet, as I knew that's when the story would really start moving. Once the action finally got going, however, the book was fantastic. It was interesting to see the Emperor and Vader's relationship in Vader's early days as a Sith. I know a lot of people are discouraged by the decision to basically do away with the previously established Extended Universe books, but if this is what the future of the Star Wars fictional universe is going to look like, I'm OK with it. Recommended, especially for Star Wars fans!